Our history and experience, as both a manufacturer and established plumbing and heating company, means we have the knowledge and expertise to offer clients a full technical support service should you need any technical assistance once your system has been installed. In addition, clients are welcome, any time either during or after installation. My builder has put the insulation below the concrete base is this ok? We would always recommend the insulation to be fitted above the concrete sub floor so that you are heating only the screed which will make your underfloor heating both more efficient and responsive, please call our technical team who will be happy to advise. Can corrosion inhibitors be used in the system ? Yes, once the system has been water tested and fully commissioned we would recommend putting an inhibitor, sanitiser and biocide which will clean and protect the underfloor heating system. With the lower temperatures used in underfloor heating systems it can create bacteria and fungi growth which could ultimately create blockages of the pipe work, manifolds and valves after a period of time and in turn making the heating system fail. The microbiological growth often has a very unpleasant smell which can cause corrosion within the underfloor heating manifold. When this takes place it can create a roughness within which will then effect the smooth and efficient operation of the system. Products such as Sentinel X700 have been specifically designed to eliminate these problems in underfloor heating systems. Will underfloor heating work with laminate flooring ? Yes it will, however please consult your flooring manufacturer regarding the type of underlay to be used with underfloor heating, so that you don’t have a highly insulated underlay which has too high resistance to allow the heat through. Why do I need another pump on the underfloor heating system ? Underfloor heating runs at a lower temperature than radiators and hot water system therefore the water temperature has to be reduced and this is done by using a blending valve. The blending valve is thermostatically controlled opening and closing the flow of hot water in to the underfloor circuit and it is essential to keep the water circulating around the heating circuit and this is done by using a underfloor pump, without this pump the circulation would only happen when the blending valve is pulling more hot water into the floor circuit. Can I extend my underfloor heating system later? Yes you can. This can be done by pre-planning and the laying of pipes and blanking off for later extension also another point to consider at this time if fitting a new heat source is to allow for future extension. Please advise us so that we can provide a large enough manifold and the necessary pipework. I have heard of floors getting too hot and people’s foot aching is this likely to happen on your system? No. This can’t happen with our correctly designed modern systems, that were a problem with the older electric systems where the electric elements was buried within the concrete with no insulation underneath, that together with the floor being used as a heat store, i.e. with the electric heating the floor overnight to gradually cool throughout the day, this meant that the temperature of the floor was very warm in the mornings and above floor surface temperature we use toady of 29° Celsius. Will underfloor heating work with renewable energy sources? Yes. 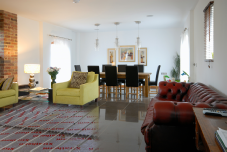 Warm water underfloor heating will work perfect with underfloor heating systems. Where is the best place to put my underfloor manifold? The best place to position the manifold is central to the underfloor heating system possibly in a cupboard. Could the pipes in the floor get blocked and not work? In the unlikely event of this happening, each loop of pipework can easily be flushed out. What is the maximum heat I can get from a underfloor heating system with screed floor and stone tiles? With BS EN 1264 Part 2 provide maximum foot comfort temperature of 29°C for living areas and 33°C for wet rooms. The underfloor heating system can provide 100 watts / m² with a room temperature of 20°C living areas with a maximum floor surface temperature of 29° Celsius. On timber suspended floor, batten and floating floors the maximum heat output 77 watts /m² at a floor surface temperature of 27° Celsius, this temperature is lower to avoid the risk of any warping of the wood. Vinyl and Linoleum floors should also be limited to 27° C to avoid any damage. Heavy duty plastic flooring can accept 29° however if in doubt please check with the flooring manufacturer. High outputs are not usually needed to today with the higher levels of insulation in new build the required heat is below 50 watts / m² making only a few degrees difference between the floor surface temperature and the actual room temperature. What temperature is the underfloor heating run at? On a solid screed floor the water temperature is typically between 30- 45° C., with a timber suspended floor, batten and floating floors a litter higher temperature will be required of between 40 – 60°C., these temperatures will vary with different floor coverings used and to how well the house is insulated. I am converting an old house with thick walls could I use wireless thermostats? If you have thick walls it may be difficult for the radio signal (RF) to go through the walls, for reliability you would be better off in using hard wiring to your thermostats. Could I install the underfloor heating myself? Yes you could, we offer full CAD drawings on your system, so if you are a practical person you shouldn’t have any difficulty, you should however use qualified heating engineer do the remaining part of the heating system and a qualified electrician to carry out the wiring of the system. I have a lot a trees and I wish to use a wood burning stove to do my underfloor heating would this be possible? Yes this is possible please ask for advise so that the underfloor heating can run at its optimum performance. We are converting an old church and we will have a high vaulted ceiling are we going to lose a lot of heat up into the vaulted ceiling area? Unlike a radiator system where the heat can rise quickly towards the ceiling, with the underfloor heating running at a much lower temperature this won’t happen because the heat tends to run out of energy just above head height. The manifold is the central point where the underfloor heating pipes are connected to. Could the pipe leak under my floor? This is highly unlikely when using quality underfloor heating pipes manufactured specially for underfloor heating system and also there are no joints within the floor with the only joints being above ground at the manifold making it easy to locate and repair. How long will the underfloor pipes last? It is important to buy a quality underfloor heating pipe with the correct European standards and approvals, and such pipes are rigorously tested under laboratory conditions to give a lifespan in excess of 50 years, but in reality it is often considered to last a lifetime of the building with the correct installation methods. Will I be able to turn off my heating when I don’t require it? Yes you will be able turn off individual rooms or the whole system if and when required. What is the difference between heating zones and a number of different pipe loops in the same room? A heating zone is the area that the thermostat controls. So where there is a large room having say 3 loops of pipework within and 1 thermostat, that is a heating zone. In very large areas say in a function room you will have a number of pipe loops (circuits) and also two thermostats making it 2 heating zones in one area. It is also possible to have one or two doing 2 rooms from 1 thermostat again this is one heating zone. I will have a block and beam floor on my new build is it possible to have underfloor? Yes block and beam floors work well with wet underfloor heating in the same way as solid screed floors do. Can I use sand and cement screed? Yes you can use sand and cement screed, however this will need to be thicker than the liquid screed. Also a liquid screed is a better heat conductor making it perfect for use with underfloor heating systems. How much insulation do I require? Usually 65mm Polyurethane will be perfect for you floor insulation however if it is new build you must comply with the current building regulations. With the pipe being either in the floor or under floor boards will it take a long time to heat up? No, this won’t be a problem. By using the right controls you will have a comfort and economy mode and can eliminate any delay, however, buildings with high heat loss or draughts could take longer; with some of our highly efficient systems it can offer a response time in less than 10 minutes. We plan to have a large lounge, will I need additional heat? No because you will also have a very large radiator (being the floor) giving you heat evenly across the room. In the bath room does the underfloor heating go under the bath, shower & toilet? No the underfloor heating does not normally go beneath the bath, shower and toilet, unless it is a wall mounted toilet or a freestanding bath, to avoid risk of the waste trap from drying out when they are not in use. Will the underfloor heating go under my kitchen units? We don’t advise to put underfloor heating under the kitchen units that it can’t possibly shorten the lifespan of any vegetables and pre-cooked foods, so ideally we would like to know where they are going first. I am having a new conservatory and I am thinking of having underfloor heating will I get enough heat with all the glazing? Yes you won’t have any problem with the amount of heat with the modern conservatories complying with the current part L of building regulations. Because the pipes are in the floor, what happens if the pipe develops a leak? This is highly unlikely. Firstly we only offer quality European made underfloor heating pipes, secondly when the underfloor heating system is installed it is tested before the floor is laid and left under pressure all of the time during and after the laying of the floor boards or screed. Should any leak occur it will most likely be at the manifold where the only joints are. There seems to be a lot of different types of underfloor heating systems available. I find it a little confusing. Yes there is a wide choice of systems available however if you want support on making a choice one of our team would be more than happy to assist. I can’t decide whether to have electric or water underfloor heating? If you choose electric underfloor heating with cables you are limited to your heat sources being electric, whereas if you choose wet underfloor heating you will have the choice of energy source giving you more options and possible financial savings. Underfloor heating is it more expensive to run, if you have to heat up the floor first to heat the room. No actually you can save between 20% to 40% on running costs because you radiator is the size of the floor you won’t need to heat it up to the high temperatures of a steel radiator, in fact the floor temperature is only a few degrees above the room temperature. How much height do I need on my ground floor to have underfloor heating? Usually 150mm above the concrete sub floor is adequate to accommodate the insulation, underfloor heating system and the screed, however you can have underfloor heating in a lot less height than that and we offer a vast variety of specialist systems, for these either see the full range of systems or ask us for details. What is the best floor finish for use with underfloor heating? Tile, Slate or Stone are the best because they are excellent heat conductors. We want to fit carpet above our underfloor heating? Even though carpet is an insulator it works well with underfloor heating. When purchasing your carpet tell the retailer that you have underfloor heating and you want to have a carpet and underlay with a TOG rating no more than 1.5. Most carpets are compatible for use with underfloor heating. Can I have different temperatures in different rooms with underfloor heating? Yes you can, you can also have different temperatures at different times of the day; for example perhaps you would want to run you lounge in economy mode until the evening and your bedrooms likewise throughout the day until later evening. We want underfloor heating upstairs in our new house but the builder has already laid the floor, is there any way that we can still have underfloor heating upstairs? Yes you can still have underfloor heating upstairs. Can I put underfloor heating upstairs with a suspended floor? I want to have a nice oak floor in my living room; can I have underfloor heating with this flooring? Yes you can have underfloor heating beneath a wood, tiles, slate, vinyl, carpet and resin flooring in fact most flooring. Is it a must to have a heat pump with underfloor heating? No underfloor heating can be run from any form of heat source. Can I have radiators in my existing house and underfloor heating in house my extension? Whether you are building a large extension or just a conservatory you can have both radiators and underfloor heating together and they can be operated independently if required. Is underfloor heating more expensive than radiator system? Underfloor heating can be far quicker to install than a radiator system. With a large house being installed in a single day, the cost of underfloor heating is more comparable with a radiator system when you take into account secondary pipework. Can I have underfloor heating in my house? Yes! Please contact us as we are sure we will have an answer for you with vast variety of wet underfloor heating systems.